MCP joint dislocation is seen in the image below. Metacarpophalangeal joint dislocation of the small finger. Posteroanterior radiograph demonstrates loss of joint space. For patient education resources, see the Bone, Joint, and Muscle Center and Breaks, Fractures, and Dislocations Center, as well as Finger Dislocation, Broken Finger, and Sprains and Strains. The bony anatomy of the finger MCP joint provides greater laxity in extension, with the shallow articular surface of the proximal phalanx resting on the spherical metacarpal head. The metacarpal head is wider in palmar orientation, which leads to increasing bony stability as the joint approaches maximal flexion. Soft-tissue constraints, including the volar plate, accessory and true collateral ligaments, dorsal capsule, extensor tendon and sagittal band, and intrinsic tendons provide additional stability to the MCP joint. This results in an arc of motion from 30º of hyperextension to 120º of flexion, 30-40º of mediolateral laxity, and a small degree of rotational laxity. The volar plate is a fibrocartilaginous structure firmly attached to the base of the proximal phalanx. Its origin, just proximal to the metacarpal head, is thin and diaphanous; this allows hyperextension of the MCP joint, but it is also the part of the joint most susceptible to injury during dislocations. The deep transverse metacarpal ligaments further stabilize the volar plates of the neighboring MCP joint. The collateral ligaments originate from mediolateral depressions in the metacarpal head and travel in a distal-palmar direction to insert onto the base of the proximal phalanx. The elliptical shape of the metacarpal head causes these ligaments to loosen in extension and tighten in flexion. The accessory collateral ligament spans from the true collateral ligament to the volar plate, providing additional joint stability in extension. The central extensor tendon and sagittal band augment the thin dorsal capsule. The tendons of the palmar and dorsal interossei add a small degree of dynamic stability. The MCP joint of the thumb is a condyloid (hinged) joint, with a quadrilateral rather than spherical metacarpal head. The capsule and ligaments of this joint are similar to those of the finger MCP joint. Additionally, the volar plate of the thumb MPJ usually contains 2 sesamoids that articulate with the metacarpal head. The insertion of the thenar muscles into the sesamoids contributes to joint stability. These bony and ligamentous constraints allow less motion than in the MCP joint of the fingers, especially in lateral motion and rotation; abduction and adduction average 10º and a slight amount of pronation occurs during flexion. Dorsal MCP joint dislocations have been described as simple or complex. Simple dislocations are those in which no soft tissue is interposed in the joint. These are usually reduced easily with an appropriate closed technique. In a classic article published in 1957, Kaplan elegantly described the anatomic features of the complex MCP joint dislocation. A metacarpal head displaced in palmar orientation sits between the lumbrical muscle radially and the flexor tendons ulnarly. The volar plate, still firmly attached to the base of the proximal phalanx, is displaced into the MCP joint. Longitudinal traction only further tightens these already taut soft tissues, trapping the metacarpal head. Complex dislocations usually require open reduction. Glickel SZ, Barron OA, Eaton RG. Dislocations and ligament injuries in the digits. Green DP, Hotchkiss RN, Pederson WC, eds. Green's Operative Hand Surgery. 4th ed. New York, NY: Churchill Livingstone; 1999. 772-807. Neviaser RJ. Dislocations and ligamentous injuries of the digits. Chapman MW, ed. Operative Orthopaedics. 2nd ed. Philadelphia, Pa: Lippincott Williams & Wilkins; 1993. 1237-50. Lourie GM, Gaston RG, Freeland AE. Collateral ligament injuries of the metacarpophalangeal joints of the fingers. Hand Clin. 2006 Aug. 22(3):357-64, viii. [Medline]. Zemel NP. Metacarpophalangeal joint injuries in fingers. Hand Clin. 1992 Nov. 8(4):745-54. [Medline]. Melone CP Jr, Beldner S, Basuk RS. Thumb collateral ligament injuries. An anatomic basis for treatment. Hand Clin. 2000 Aug. 16(3):345-57. [Medline]. Posner MA, Retaillaud JL. Metacarpophalangeal joint injuries of the thumb. Hand Clin. 1992 Nov. 8(4):713-32. [Medline]. KAPLAN EB. Dorsal dislocation of the metacarpophalangeal joint of the index finger. J Bone Joint Surg Am. 1957 Oct. 39-A(5):1081-6. [Medline]. [Full Text]. Tabib W, Sayegh S. Simultaneous dislocation of the metacarpophalangeal and interphalangeal joints of the thumb. Scand J Plast Reconstr Surg Hand Surg. 2002. 36(6):376-8. [Medline]. Inoue G, Miura T. Locked metacarpo-phalangeal joint of the thumb. J Hand Surg [Br]. 1988 Nov. 13(4):469-73. [Medline]. Beck JD, Klena JC. Closed reduction and treatment of 2 volar thumb metacarpophalangeal dislocations: report of 2 cases. J Hand Surg Am. 2011 Apr. 36(4):665-9. [Medline]. Ip KC, Wong LY, Yu SJ. Dorsal dislocation of the metacarpophalangeal joint of the thumb: a case report. J Orthop Surg (Hong Kong). 2008 Apr. 16(1):124-6. [Medline]. [Full Text]. Vadala CJ, Ward CM. Dorsal Approach Decreases Operative Time for Complex Metacarpophalangeal Dislocations. J Hand Surg Am. 2016 Sep. 41 (9):e259-62. [Medline]. Dinh P, Franklin A, Hutchinson B, Schnall SB, Fassola I. Metacarpophalangeal joint dislocation. J Am Acad Orthop Surg. 2009 May. 17(5):318-24. [Medline]. Maheshwari R, Sharma H, Duncan RD. Metacarpophalangeal joint dislocation of the thumb in children. J Bone Joint Surg Br. 2007 Feb. 89(2):227-9. [Medline]. Marcotte AL, Trzeciak MA. Nonoperative treatment for a double dislocation of the thumb metacarpal: a case report. Arch Orthop Trauma Surg. 2008 Mar. 128(3):281-4. [Medline]. Orozco JR, Rayan GM. Complex dorsal metacarpophalangeal joint dislocation caused by interosseous tendon entrapment: case report. J Hand Surg [Am]. 2008 Apr. 33(4):555-7. [Medline]. Peterson JJ, Bancroft LW. Injuries of the fingers and thumb in the athlete. Clin Sports Med. 2006 Jul. 25(3):527-42, vii-viii. [Medline]. Khursheed O, Haq A, Rashid S, Manzoor N, Shiekh S, Mushtaq M. Clinical Outcome of Metacarpophalangeal Joint Dislocation of the Thumb in Children: Case Series of 10 Patients. J Hand Microsurg. 2016 Apr. 8 (1):13-6. [Medline]. Metacarpophalangeal joint dislocation of the small finger. Oblique radiograph best demonstrates dorsal dislocation of proximal phalanx. Metacarpophalangeal joint dislocation of the small finger. 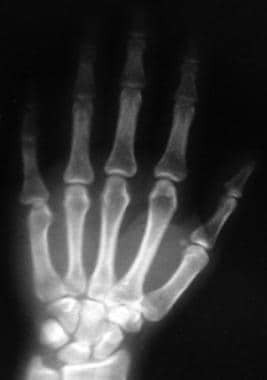 Dorsally dislocated proximal phalanx is obscured by other digits. Note that the small finger metacarpal sits palmar to the other metacarpals. Disclosure: Received ownership interest from South Bay Sports and Preventive Medicine Associates, Inc for board membership. The authors and editors of Medscape Reference gratefully acknowledge the contributions of previous author, David R Steinberg, MD, to the development and writing of this article.